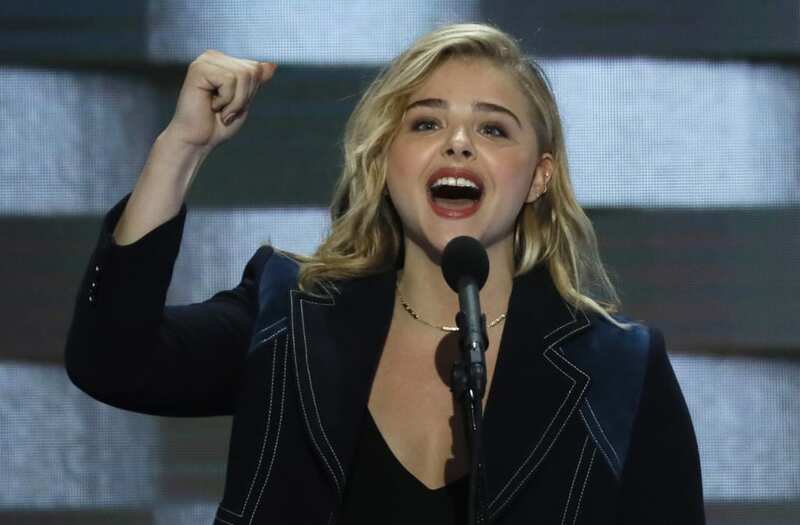 Chloe Grace Moretz became one of the loudest — and youngest — public supporters of Hillary Clinton during the 2016 presidential campaign when she spoke at the Democratic National Convention, joining the likes of Meryl Streep, Lena Dunham and Katy Perry. One year later, even though her candidate did not win, Moretz is not quieting down. In fact, the 20-year-old actress using her voice to motivate her young fans to become politically active during the Trump presidency, which she describes as a "mockery of our system." In an interview with Varietyfor this week's Power of Young Hollywood issue, Moretz talked about some of her favorite female role models including Clinton, Julianne Moore, Jessica Chastain, Reese Witherspoon, Scarlett Johansson, Emma Watson and her best friend, fellow actress Zoey Deutch. Two women who didn't make the cut on Moretz's list? Melania and Ivanka Trump. When asked about her feelings toward the Trumps as role models for young women, Moretz paused and took a moment to think. "This is a difficult one to word," she said with some hesitation. "I think some people are in a bubble and it's a very sad bubble," Moretz said. "I hate to see any woman not speaking up for themselves and what they believe in. I wish they were more aware of their surroundings and I wish they were more aware of what their husband and father are doing. It pains me to see people who are just speaking through this veiled curtain of privilege and they have no compass of what is real." Moretz noted that she's never met either Melania or Ivanka Trump. "I'm not them. I don't know them," she admitted. "I can only speak on what I see and it saddens me." "I think that young women deserve better role models," she continued. "And I hate to see the way that Melania is treated — I think that she is treated really badly, and I hate to see a woman who is not respected by her own husband, and a daughter who doesn't see that she is disrespected by her father. I think that's really sad. I think they're also products of mental manipulation. You can't see the forest through the trees when you're that deep." Asked what worries her the most as a young woman living in the Trump administration, Moretz replies: "It's the concerns we all have. It feels like years and years of marching and protesting is being striped from beneath us." 2016 was the first year Moretz voted in a presidential election. Looking ahead, the actress plans to campaign once again in 2020 for the candidate of her choice. "I'll support whoever is the best candidate and support whoever I really connect to and who will be perfect for our presidency," she says. "In my dream of dreams, I'm still like, 'Hillary, maybe you'll run again!'"